A certain young lady of my acquaintance is entering high school this year and to celebrate, her parents have given her a complete room makeover. While I have decorated her room in the past, this year, she was in charge. She selected this “Sweet Chenille” dot duvet and sham set from PBTeen. The chenille dots are exactly the color of Tiffany Blue and they will be painting her bedroom this color, with new all white decorative moldings and a new all white bedroom set from Ikea. I only played a tiny roll – which was recovering her window seat cushion. Her mom (one of my bff’s) brought me the old cushion and one single dot pillow sham. The bedding is out of stock and the only extra fabric she could get hold of was this one sham. It wasn’t enough to make the whole 24×36 box pillow with, or even just one side. So, ultimately. I suggested we cut the dotted fabric into strips and piece together for the box border. Add some soft brown ultra suede and we’ve got ourselves a pretty fun, custom, cushion! (see above). 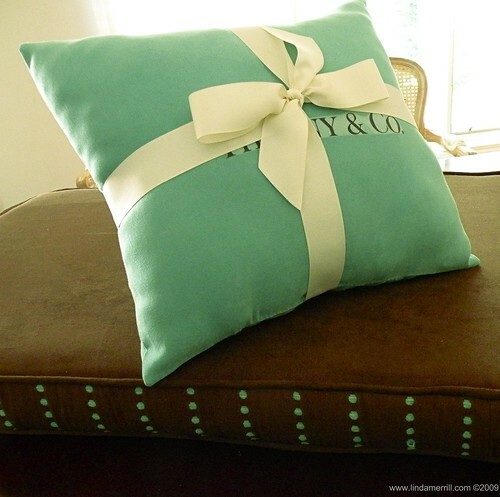 I always like to throw a little something extra into client projects and decided to add in a “Tiffany Box” pillow. I found the exact shade of fabric – which considering the uniqueness of the color was practically a miracle. I then went online and found a high quality version of Tiffany & Co.’s logo and downloaded it. I opened the file in Photoshop and flipped it horizontally so I could print it on iron-on transfer paper. I cut out the transfer as close to the lettering as possible and following instructions, I applied the logo to the center of the fabric square. (the pillow is approx. 16×16). I sewed up the sides of the pillow and filled with batting, hand sewing the opening. 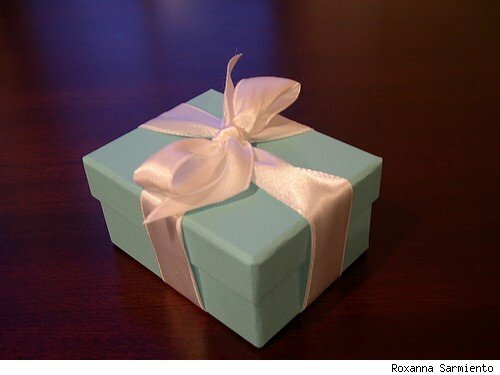 Of course, on a Tiffany box, one needs the perfectly tied bow! Back to the internet (really, what did we ever do before we could look up and download EVERYTHING! ), I found these great instructions for tying a Tiffany bow. Pretty good, no? I’m on my way over there now. Hope she likes it!! 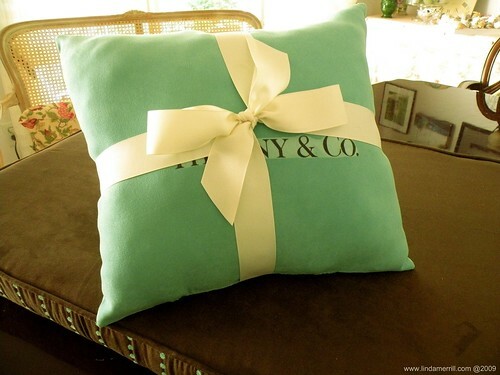 ps – “Tiffany & Co.” is a registered trademark and cannot be used for commercial purposes. In other words, I could never sell this pillow. However, I thought it made a cute project to showcase because it’s so easy to do that it might give you ideas on the uses of iron-on transfer paper and a little bit of time and material!